"The Avatar and the Rose Prince"
1. "RE: The Avatar and the Rose Prince"
*applause* Nice job blending styles. 2. 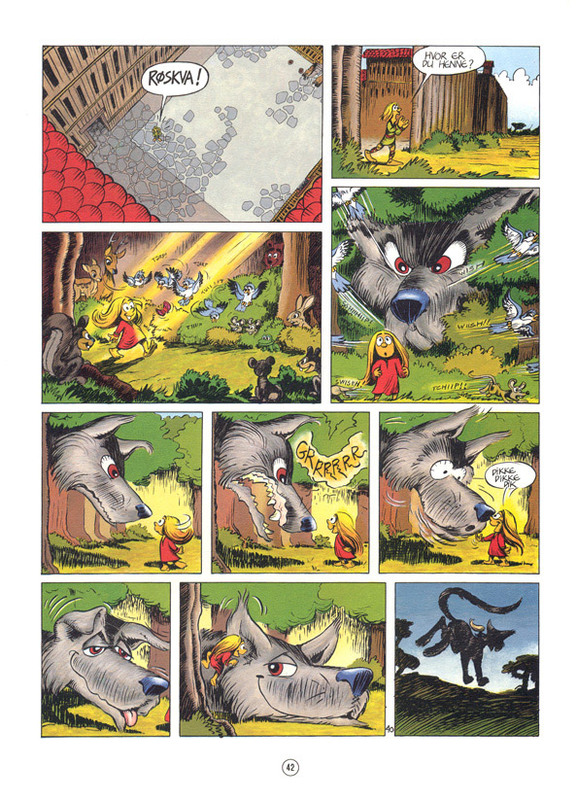 "RE: The Avatar and the Rose Prince"
And, judging from what looks like fur, one HELL of a big doggie. Hope Fenris is a good boy! 3. "RE: The Avatar and the Rose Prince"
>Fenris is a good boy! 4. "RE: The Avatar and the Rose Prince"
5. "RE: The Avatar and the Rose Prince"
The Polar Bear-dog (Canursus maritimus) is a native predator of the south pole of Diqiu, where it feeds mostly upon other predators like Tiger Seals and sharks. It is quite a good swimmer, and extremely powerful, able to in some cases carry an Avatar and her three closest friends. Few in history have tamed these savage beasts-a fact that may be hard to believe in light of their apparent affability and curiosity. This is because there is little they have reason to fear or avoid aside from other Polar Bear-dogs. While they may seem friendly, they are more interested in how you might taste. 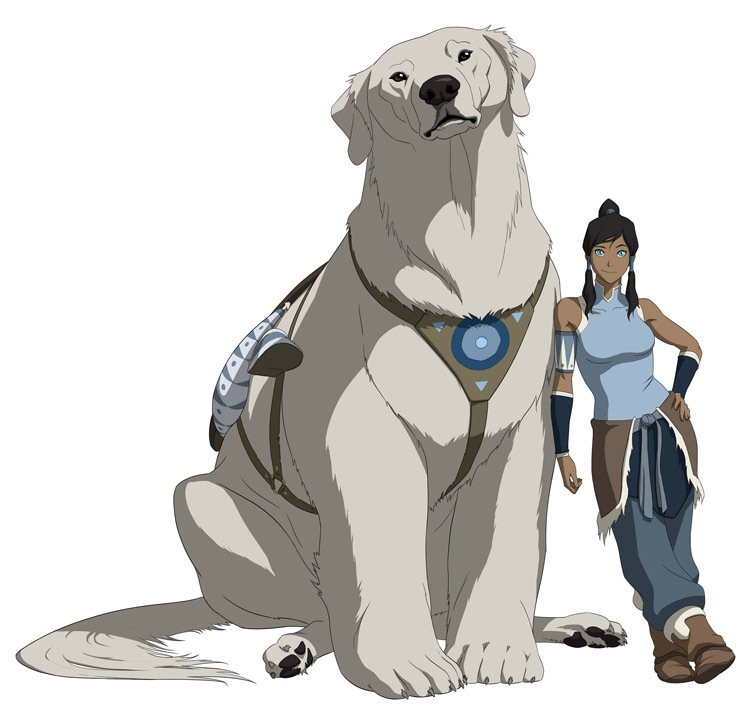 Korra raised Naga from a puppy, and she is, as far as I know, the only extant tamed member of her species. More traditionally, they might be hunted as a rite of passage, because their flesh is mildly toxic-and their livers are deadly. Hides and bones are still of some value, but often difficult to recover since a wounded bear-dog may retreat into the water and die where it cannot be found-if it does not fly into a rage and attack the hunters. Since killing them is therefor a waste of time and effort that is likely to end with someone dead or in the need of a healer's services, it is not a task for any but the foolhardy and brave. 6. "RE: The Avatar and the Rose Prince"
>extant tamed member of her species. 11. "RE: The Avatar and the Rose Prince"
>6(?) 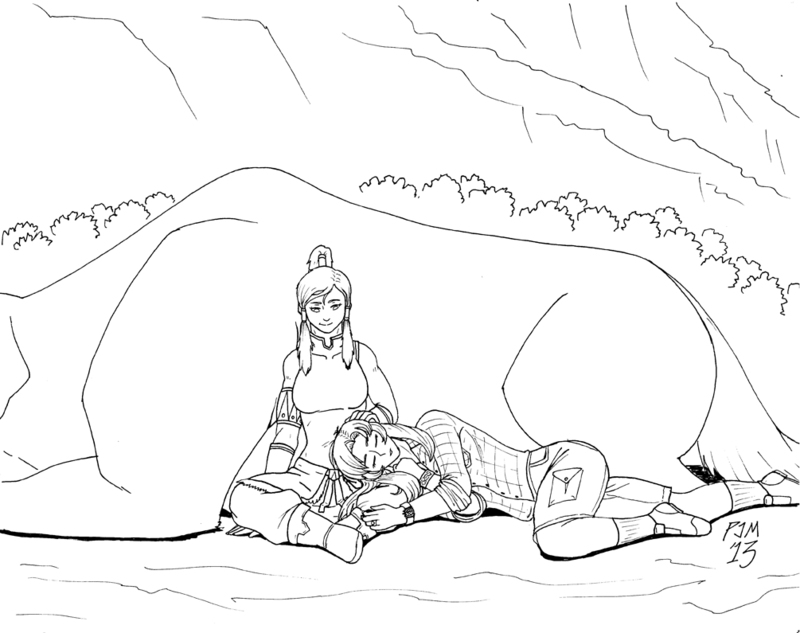 of Korra's dearly departed companions. That... has probably happened, yes. Avatar Kuruk's spirit is ever so jealous. We know the names of six, but it's fairly strongly implied that there are more. 14. "RE: The Avatar and the Rose Prince"
Actually, I'd go with six or seven. That's a good number; it means Korra replaces one about twenty years or so, which would be on the low side for a polar bear that has someone to care for it in it's infirmity but on the high side for a dog, so it evens out. Any more than that would imply there were periods when there was some... fairly rapid turnover. Which is okay, but it may be a can of worms you don't want to open. Although I suppose Korra could have adopted some as full adults rather than puppies... but seriously, who is gonna pass up the chance for puppy? "On my way to the station this morning, I found a strange man on a swing suspiciously close to the dog park that we are not supposed to know about. This man was wearing a blazer and a bowtie, which he informed me was �cool�. He is in the studio right now, trying to force a fez onto my head. He looks human, but it is painstakingly obvious he has, in fact, two hearts." 16. "RE: The Avatar and the Rose Prince"
>infirmity but on the high side for a dog, so it evens out. I have no intention of allowing this to turn into a conference about the mathematics of polar bear dog generations, but I will just note that there is sometimes overlap. She only has one right now, but that doesn't necessarily mean it's always the case. 18. "RE: The Avatar and the Rose Prince"
"A large pyramid has appeared in the center of the Beatrix Loman Memorial meditation zone, destroying over half of the zone's state-of-the-art meditation equipment and paraphernalia. Experts have been contacted as to what could cause sudden pyramid existence." 8. "RE: The Avatar and the Rose Prince"
>>extant tamed member of her species. Ehhhn, I would be leery of this too-they are large and probably dangerous animals-domestication doesn't happen overnight, and unless there has been a concerted effort to shrink their flight-distance, it's more a subject of random walks and who has or hasn't been put down for chewing off the neighbor kid's head. It's like having a tiger for a pet-even if it was bred from captive stock for five generations, that's still a tiger, and still fundamentally a wild animal. I'm not ruling out something like the Siberian fox program, I just don't think that's terribly in character for Korra. Even if they don't intend to, they could do a lot of damage, especially to children and the elderly. And then there is the cost of feeding them-nothing to sneeze at since they may weigh more than the rest of the igloo combined and likely turn up their noses at stewed sea-prunes. I'm not saying it can't be done. I'm just saying that it sounds like a lot of trouble. 13. "RE: The Avatar and the Rose Prince"
>down for chewing off the neighbor kid's head. 15. "RE: The Avatar and the Rose Prince"
I love that Avro Arrow thread. I use it as an example of how to not argue productively on the internet. "New billboards have appeared all over town, bearing the image of a turkey sandwich and the single word, �HARLOT�, in large, block letters." 17. "RE: The Avatar and the Rose Prince"
>I love that Avro Arrow thread. [ M-x yoda ] That... is why you fail. 19. "RE: The Avatar and the Rose Prince"
>>down for chewing off the neighbor kid's head. Hey man, this time is different. I'm not saying it's impossible-just that if the neighbors start breeding tigers or polar bears, I'm leaving town before there's an accident. And my father would probably move to another state, province or district to get away from this kind of thing. He's kinda skittish when it comes to large animals. I guess we can put this down to a generation gap or fundamentally different perspectives on storytelling. Because we definitely have major miss-matches in our expectations. 20. "RE: The Avatar and the Rose Prince"
>>>extant tamed member of her species. Okay, how about you tell the people who air the show this? 10. "RE: The Avatar and the Rose Prince"
I read this as Korra being the only extant tamed member of her species. 12. "RE: The Avatar and the Rose Prince"
21. "RE: The Avatar and the Rose Prince"
Polar Bear Dog: Naga! Girl I heard you got a human! Naga: Yeah, named her Korra, she's a bit troublesome at times but it's kind of like a pup. PBG: Well be careful, thouse humans are shifty creatures. They want to fight anything. When in Danger, or in Doubt.